201 Epoxy Repair Mortar is a high strength, trowel applied, two component epoxy resin mortar, designed for rapid and permanent repairs to concrete and masonry floor surfaces. Ideal for repairs to spalled or damaged concrete; chemical bunds; bedding pre-cast concrete beams; nosings on expansion joints; floor repairs. 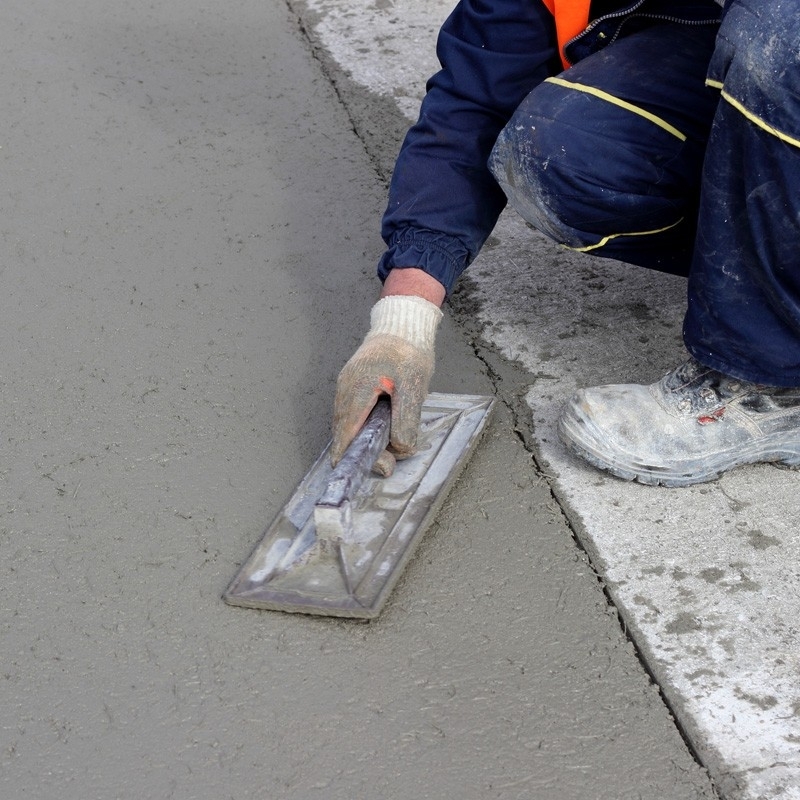 201 Epoxy Repair Mortar is a high strength, trowel applied, two component epoxy resin mortar, designed for rapid and permanent repairs to concrete and masonry floor surfaces. 201 Epoxy Repair Mortar is a blend of epoxy resin, polyamine curing agent, graded aggregate and colour pigments. The mixed material is applied to a suitably prepared surface, and quickly cures to form a durable, abrasion and chemical resistant repair. 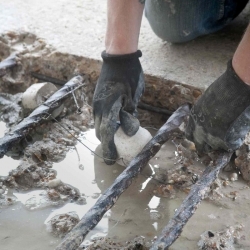 Repairs to spalled or damaged concrete; chemical bunds; bedding pre-cast concrete beams; nosings on expansion joints; floor repairs. Remove all laitance, spalled concrete, grease, oil, dust, and other contaminants by scabbling or bush hammering, to provide a sound, clean, substrate. Any exposed reinforcing steel shall be fully exposed by cutting out around its full circumference, and cleaned by abrading or grit blasting to remove rust, scale, etc. Primer not normally required. For exceptionally porous surfaces, please contact our Technical Department for specific advice. 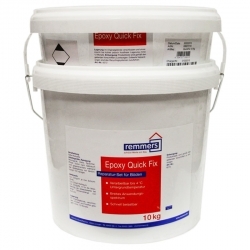 201 Epoxy Repair Mortar is supplied as a two component pack. Each component is pre-weighed and ready to mix. The contents of the CURING AGENT should be added into that containing the BASE and the two components thoroughly mixed, by spatula or low speed drill/stirrer, or forced action mixer. 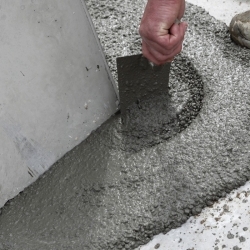 Apply the 201 Epoxy Repair Mortar by tamping and trowelling to ensure good compaction and a tight finish. The material should not be feather edged. Maximum thickness in horizontal applications is 50mm. For vertical applications see 202 Vertical Surface Repair Mortar. Clean equipment with 109 Tool Cleaner prior to curing of the mortar. 201 Epoxy Repair Mortar will have hardened sufficiently after 5-6 hours cure @ 15-20°C to allow full trafficking. Longer periods of cure will be necessary at lower temperatures. 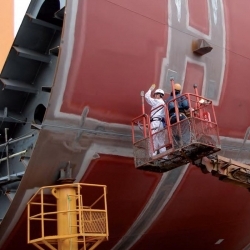 Full mechanical and chemical resistant properties will be achieved after 3 days cure @ 20°C. It is preferable to apply a sealer coat if exposure to chemicals is likely. Please construct our Technical Department for specific recommendations. Do not apply to wet or uncured concrete surfaces. Do not apply at temperatures of 3°C or less. Outside slab needs repair can colour dye be added to mix. or can it be painted over at a later date. many thanks. We don't recommend the use of dyes or pigments with our 201 Epoxy Repair Mortar, however it can be pigmented to any RAL or BS colour on request by ourselves. It should be noted though that due to the filler in the product, colours will not be exact. 201 Epoxy Repair Mortar can also be over painted with compatible topcoats if desired. Can this product be used on polished concrete floors? I need to be able to polish the repair once done. 201 Epoxy Repair Mortar has a fairly tight finish. You will have to mechanically grind and then polish the system to try to match the finish of the concrete. Yes this product can be used externally, maximum thickness per application is 50mm. 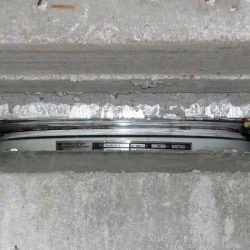 Question: On two roof gullies, the concrete has fallen away from the roof tile edgings. I intend to hack out the decaying concrete and fill the edgings with a suitable product. Can you recommend anything? For vertical repairs of this nature we would recommend our 202 Vertical Surface Repair Mortar. Yes, as long as you allow sufficient time for the 201 Epoxy Repair Mortar to cure before refilling the pool it can be used and left un-coated or re-coated with a compatible covering. SikaSet 45 is a low temperature, rapid hardening repair/bedding mortar. SikaSet 45 is a one component magnesia phosphate based, rapid hardening and high early strength concrete repair and ironwork bedding mortar for use in temperatures as low as 0°C. SikaGrout 3200 is a fast hardening, high early strength, high final strength, 1-component, shrinkage compensated, free flowing cementitious grout for structural filling of joints and under grouting base plates. 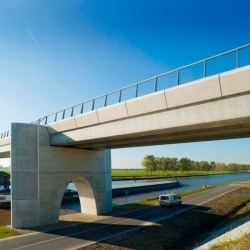 High performance precision grouting of vertical or horizontal joints for onshore steel and pre-cast concrete wind towers. SikaCem 133CP Gunite (formerly Sikacrete CP) is cement based one component repair mortar containing limestone aggregate and meeting the requirements of Class R4 of BS EN 1504-3. Formulated for machine applications using the dry process without set accelerators. Repairs and overlay may be profiled and trowel finished where necessary. 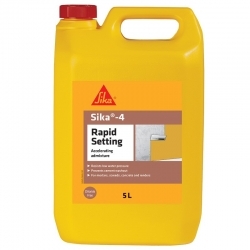 Sika 4 Rapid Setting is a ready to use quick setting leak stopping liquid for use against low water pressure infiltration. It is used to aid the quick setting of cement based renders and concretes where low water pressure or slow moving water exists. International Intergard 821 is a two component solvent free epoxy filler, which is easily mixed and applied by knife or trowel. Intended as a filler for correctly prepared, corroded and pitted steel prior to coating maintenance. 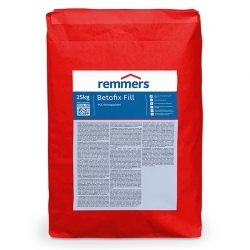 203 Deep Fill Repair Mortar is a versatile, trowel applied, three component Epoxy resin-based, deep section screed/mortar for economical, fast setting repairs to deeper section areas. 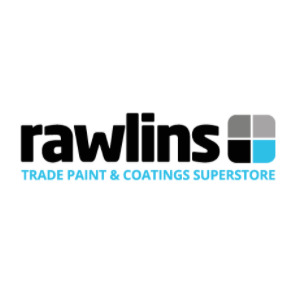 The product is supplied in a concrete grey colour, and may be sealed or topped with a range of our epoxy floor coatings or sealers as required. 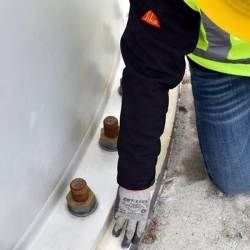 Sika Galvashield Embedding Mortar is a controlled resistivity mortar for use with Sika Galvashield discrete corrosion protection anodes. 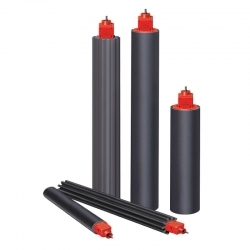 The mortar is designed to provide a low resistance environment around the anode and improved performance. Sika MonoTop 615 is an R3 cementitious high build concrete repair mortar. 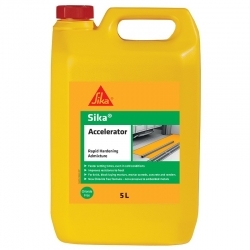 Sika MonoTop 615 is a one component cement based polymer modified high build repair and reprofiling mortar, meeting the requirements of Class R3 of BS EN 1504-3. Sika Injection Packers Type MPR Button are packers fitted with Zerk button heads for higher pressures and flow rates (e.g. for curtain injection).